Here at Official Aspire, we supply a wide range of small, high-quality and reliable Clearomizers for vaping – including replacement coils and clearomizer tanks. Aspire BVC clearomizers and coils are what the industry consider to be the "best of the best" and it pays if you know what they are. A coil is something that’s found in an e-cigarette. The coil itself is a wire wrapped around a wick, heated up by a battery. When the battery is fired, it then heats the wire and, in turn, the e juice. Once the e juice is heated up, it is absorbed by the wick and travels through the tank to form a vapour which can then be inhaled. SO, WHAT ABOUT ASPIRE BVC COILS? BVC stands for ‘Bottom Vertical Coil’ and simply means that the coils are built vertically instead of horizontally. 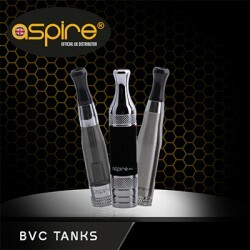 When it comes to finding coils that suit BVC tanks, look no further than our extensive collection at Official Aspire. One of the most popular coils is the Aspire BVC, a single BVC coil that’s specifically designed to suit our clearomizer tanks. The CE5 is still widely sold globally because its an Aspire clearomizer. It incorporates a modern style, in comparison to the older clearomizer, but is the same shape. This has a dual coil heating element, which provides twice as much vapour than any other clearomizer. With a capacity of 1.8ml, the CE5 has a bottom-filling system which ensures less e liquid is wasted. The CE5 Aspire clearomizer has a 510 drip tip which makes it easy for you to customise the unit to match your requirements. Our clearomizers are affordable and easy to use and always deliver when it comes to performance. Here at Official Aspire, we supply Aspire BVC coils to power our basic range of tanks. To make it easy for you to replace coils whenever you see fit, we supply the Aspire coils in packs of 5. They are designed to power the Aspire CE5, Aspire ET-s glass and the Aspire K1 and K2 starter kits. We supply our BVC Aspire coils in 1.6ohm and 1.8ohm, allowing you to choose the resistance you need. If you need to know more about any of the products that we supply at Official Aspire, call us today on 0333 577 5002.